"The gospel is the only way to be saved. Moreover, it is the only way to grow in the grace and knowledge of the Lord Jesus Christ. 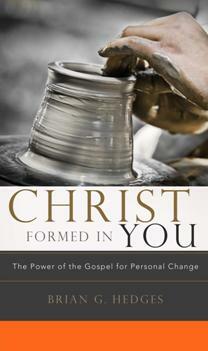 Brian Hedges has done the church a great service in writing this book, Christ Formed in You, which reveals the God-intended path of sanctification. The ultimate goal in spiritual maturity is to transform believers into the image of Christ. This book is a helpful primer in the pursuit of personal holiness and true life-change from a transformed heart. Those who apply the message of this insightful book will, by God’s grace, find themselves growing into authentic Christlikeness." "With clarity, balance, common sense, and a relentless commitment to keeping his eye on the goal, Brian Hedges sets the fullness of the gospel to work on the lives of believers, wielding it like a craftsman to shape us into images of Christ." Discerning Reader predicted this would be one of the Notable Books of 2010. Sign up here to have all 22 excerpts delivered to you by email. Beginning with Excerpt 1, you will receive one new excerpt every third day. Buy from Amazon or directly from Shepherd Press.